When safety is compromised on a construction project, the consequences can be catastrophic. Over the years, construction accidents have resulted in many severe injuries and fatalities throughout the State of Alabama and across the country. If you experienced an injury or lost a family member due to an on-the-job construction accident, then the Birmingham, Alabama, construction accident attorneys at Hollis Wright can help. According to the Occupational Safety and Health Administration (OSHA), construction sites are the most common place for workplace fatalities to occur. In fact, one in five worker deaths are typically attributed to construction site accidents. And for every fatality, there are countless injuries that do not result in death but are often very serious. These injuries can leave workers with lost wages, emotional distress, an inability to return to work, physical disabilities, financial hardships, mounting medical bills and more. While most construction site injuries involve workers on the project, some involve bystanders and/or pedestrians merely passing by the project. Non-workers injured by construction site activities would also likely have a legal claim for compensation against anyone who wrongfully caused the incident. Construction-related accidents are typically complex and require significant financial resources to prove liability. It is imperative that you retain an attorney and law firm that, not only has the experience to handle these types of cases, but also posses the resources and the ability to invest in your case. Expert witnesses with a background in construction work are usually needed to assist in determining what happened and who was at fault for causing the accident. Because of our experience in this area, we have a diverse group of experts who we routinely retain to assist in pursuing these types of personal injury claims. 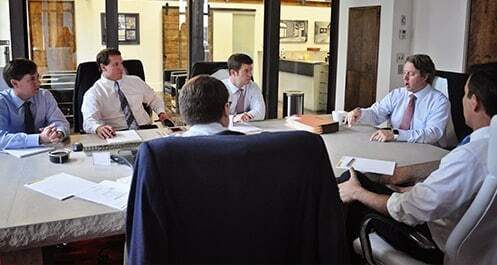 Our attorneys are committed to making this type of an investment in each case and aggressively pursuing your claim. If you or a loved one has been hurt or killed in a construction accident, don't hesitate to call the skilled Birmingham construction accident attorneys at Hollis, Wright, Clay & Vail, P.C. Due to the unique dangers at construction sites, companies must be vigilant in ensuring all safety practices are up to date and all equipment is operating safely. Unfortunately, accidents are still prevalent, often due to negligence or improper safety precautions. Our attorneys have settled many claims throughout Alabama for those injured or killed due to no fault of their own while working on a construction site. We are well-versed in the federal regulations that mandate safety in the workplace and will work tirelessly to secure any compensation to which you are entitled. Centrally located in Birmingham, the construction accident attorneys at Hollis Wright will stand up for you. Contact us now for a free consultation.